We know that for our cloud hosted customers, maintaining 24/7/365 access to their booking information is crucial to the smooth running of their business operations. We therefore strive to make every reasonable effort within our control to ensure 100% uptime of our cloud servers and infrastructure. However, as with any IT infrastructure, in the unlikely event that unforeseen circumstances arise which are beyond our control, 100% uptime can never be guaranteed. We are, for instance, reliant on external data centers and ISPs to provide us with infrastructure and services to then allow us to provide hosted MIDAS services to our customer. Our ISPs guarantee us 99.9% uptime of their infrastructure and services. 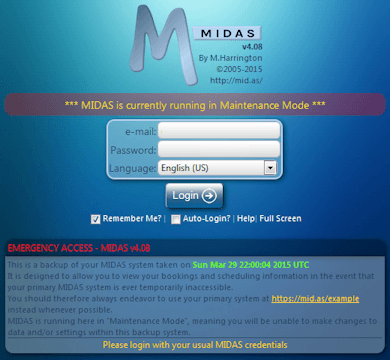 That's why we are able to offer an optional "Emergency Access" addon to customers who choose to have their MIDAS systems remotely hosted by us in the "cloud". With this optional addon, our cloud hosted customers are provided with a secondary "Emergency URL" in addition to the primary URL used to access their hosted MIDAS system. At this secondary "Emergency URL", a completely separate MIDAS system runs on a separate server, in a different data center, though a different ISP. This means that should there ever be any issues affecting our hosted customer's ability to access to their primary scheduling system, with this addon, they'll still be able to access all their booking and scheduling information via their secondary "Emergency URL" backup. The data contained at these "Emergency URLs" are exact copies of the data held in the corresponding "live" systems, and is updated in "real-time". If maintaining 24/7/365 access to your room booking and resource scheduling information is paramount, you should consider this add-on!